During the 1880s the first Colorado pioneers fell in love with the vast splendor of Colorado’s Rocky Mountains. Trapping beaver to supply fur for the fashionable top hats of city dwellers drove the earliest economy and most likely the name of the local creek. These early settlers took up homesteads at the convergence of “Beaver Creek” and the Eagle River and named their picturesque new home- Avondale. Today, more than 130 years later, the city’s name has been compressed but the list of visitors to Avon, Colorado continues to expand. Tens of thousands trek to the gateway of world-class skiing and its accompanying luxury resorts each winter. However, far too many visitors fail to recognize that even after the heat of summer melts the snow away– the same beautiful scenery and fabulous resorts remain at off peak prices. 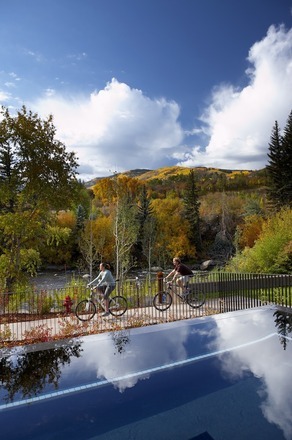 Sun-scorched Texas families are now on notice; a wide-variety of outdoor activities and more importantly cooler temperatures are waiting for you in Avon, Colorado. Nestled at the base of three distinct mountains, Beaver Creek, Bachelor Gulch and Arrowhead, Avon is a little over 100 miles west of Denver. Avon is known as the “Heart of the Valley” not only for its proximity to these mountains but also for a family-friendly atmosphere that many Southlake residents should find familiar. What’s not so familiar, thanks to peak elevations 11,440 feet above sea level, are August high temperatures twenty to thirty degrees cooler than our dog days of summer. Daily highs in the mid 70s bring back the joy to hiking, biking and a round of golf ultimately making the drive from Southlake well worth the effort. 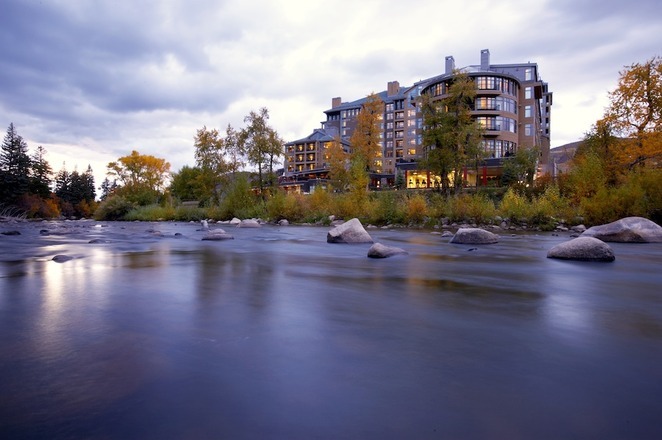 When in Avon, there is no better place to stay than the Westin Riverfront Resort and Spa along the banks of the Eagle River. The AAA rated Four Diamond resort proves its luxury chops as Conde Nast Traveler’s number one choice amongst “Top Ski Hotels” in North America. During the summit of ski season, rooms at this posh, yet family (and dog) friendly, resort exceed $2,000 per night. This modern marvel originally opened in 2008 and quickly became the valley’s hottest destination. Many of its 230 custom designed rooms boast high ceilings and extra large windows framing glorious Beaver Creek mountain views. Fashion and function come together perfectly in the Westin’s expansive one, two and three bedroom condominiums, which offer full kitchens and five piece bathrooms fit for a king – and his family. Fitness get-a-ways are in demand as the award-winning resort just recently completed its $1 million renovation and expansion of its fitness center. The new Athletic Club at The Westin features a lengthy array of wellness offerings, including the renowned Spa Anjali, a full-service salon in addition to a state-of-the-art fitness center with distinct cycling, pilates and yoga studios providing the utmost variety for beginning and even the most seasoned fitness enthusiasts. For exercise or just a romp with the kids, the entire family will love the heated, all-weather saline-based lap pool and three oversized mountain-view hot tubs. In the summer, peak rates give way to family value as rooms at this resort, which also recognized as the #2 U.S. Resort, #4 U.S. Resort Spa and #1 Western Golf Resort by Conde Nast Traveler, can be yours at a dramatic discount – so insist on the mountain view! The Westin makes for the perfect home base from which to launch a wide variety of outdoor activities from serene hiking and fly-fishing jaunts to adrenaline pumping white-water rafting and zip-lining adventures. Experience the mountains, a pristine lake or a field of wildflowers with the experts at the Beaver Creek Hiking Center, which specializes in guided nature hikes and mountain bike tours for all ages and abilities. Relax and enjoy the views as your guides manage transportation, packs, boots, hiking poles, gear, water and snacks. Try the “Family Fun Hike” a two and a half hour “gentle” trail geared towards families with children 12 and under. Additional equipment including child-carrying backpacks are available to rent. Relaxing and experiencing nature is what Colorado is all about and fly-fishing is one activity that gives it all while your feet are firmly planted in fresh water lakes and rivers. For over 30 years Gore Creek Fly Fisherman has been there for the fishing public and visitors alike. Recognized as the area’s most prominent guide service they provide the gear and the guide, just bring your desire to tackle the finest trout fishing the country has to offer. On the spicier side of the river is white-water rafting where Lakota Guides has been serving up fun for over twenty years. Operating on the Eagle and Colorado rivers Lakota is able to offer Class II and III family style outings. From June through August the more adventurous types can opt for Class IV and V excursions that are ripe for the rafting on the highly sought after Arkansas River. Some say the best way to experience the mountains is to get a birds-eye-view. The closest thing we’ve found is to fly like an eagle along the zip-lines at Zip Adventures located at the 4 Eagle Ranch in nearby Wolcott. With a course of six different zip-lines extended over a deep ravine this excursion is wild enough for the kid in you and safe enough for the kids with you. For many the phrase, “Get out and play,” means a round of golf and when it comes to golf in the valley you must try Red Sky. Red Sky is a private golf club with two championship courses, one designed by Tom Fazio, the other by Greg Norman. Tee times for these exclusive courses can and should be made in advance (up to one month). Be on the lookout for both deer and elk throughout as great care has been taken to preserve their natural migration patterns along the ridge separating the two distinct courses both rated as the #1 and #2 "Courses to Play" in Colorado. The only way to play these beautiful mountain courses is by staying at one of their partner properties, which as of 2012 includes the Westin Riverfront Resort and Spa. Getting rid of stress is a big reason why you go on vacation and that is why the Spa Anjali located within the Westin Riverfront is a can’t miss activity just for you. Meaning “divine offering” in Sanskrit, Spa Anjali was recently named as one of the country’s top spas most likely because of its mountain themed “journeys”. Its signature Rocky Mountain journey calls on the healing properties of indigenous herbs and organics while their Alpen Journey utilizes mineral rich muds and aromatic oils to soothe both mind and body. Relaxed and refreshed, and probably a bit hungry from the day’s events, nighttime is the right time to take to the streets of the Colorado Valley. With so many chef inspired restaurants and local favorites from which to choose, you’ll always find what you are looking for. Staying on property at the Westin Riverfront, you need look no further than the lobby to find Cima and the contemporary Latin cuisine (think Short Ribs in hoisin-adobo sauce) of internationally acclaimed Chef Richard Sandoval. A little further from the beaten path lies the mountaintop menu of Beano’s Cabin. When we say off the path we mean it- the only way to reach the restaurant in the summer months is by horseback or a John Deere tractor. Both the food and the view will take your breath away as you choose from a 5 course menu that includes the likes of spruce crusted elk loin, whiskey glazed leg of lamb and a wood grilled smoked salmon with lemon risotto. Finish off the meal with the tropical Mango Mousse Taco and you’ll have one mouthful of a story to tell. If you want to eat like the locals, then Coyote Café is the place to be. Beaver Creek’s first bar and restaurant has the basics down cold from burgers and sandwiches to one of the area’s largest variety of bottled and craft brews. After the meal enjoy live music from well-known names and current stars at either the Vilar Performing Arts Center (VPAC) in Beaver Creek or the Gerald R. Ford Amphitheater in nearby Vail. There is no need to suffer through the Texas summer heat. Pack up the family and head to Avon, Colorado where you’ll find everything you want in a summer family get-a-way.